Guess Who's Coming to Dinner? Are you willing to host a meal for our newcomer friends, during the Easter weekend, 19-22 April? Contact Geoff Beatty with the day/time & how many people you could invite. We will match you with our friends who sign up for this great opportunity to share in a Christian holiday. See Geoff Beatty or geoffsidy@gmail.com 289-775-1648. Good Friday Service, April 19 – service at 3:00 p.m.
One group of child care will be provided for 0 – 3 year-olds. Join us for our Easter Sunday service at 10:45 a.m. Childcare is available in Nursery & Hive. Congregational Workday - Saturday, May 11. Mark your calendars. Help to clean up the parking lot, paint areas around the church, work in the Sanctuary, have a great time & share lunch with us. Sign up for your area of commitment on the main notice board. A round table discussion hosted by PMC Urban Ministries and the Chaplaincy of Salvation Army Booth Centre will be exploring the issues faced by folks living on the margins and ways in which you can engage and be part of the solution. See Geoff Beatty for more information: geoffsidy@gmail.com 289-775-1648. Looking forward to summer – “A Place at the Table: the Kingdom of God at Work” will run from July 15-19 and August 12-16. Book your calendar for 2 weeks of inter-generational learning and service! Watch for details. We plan to hold Baptisms on Easter Sunday, April 21st. Please read the Baptism document in order to familiarize yourself with the qualifications of a baptismal candidate. If you have any questions, please contact Pastor Worrad. We want to sit down with you and talk about the meaning of baptism and your profession of faith in Jesus, so you should let us know of your interest in baptism at least two weeks before. We may also offer baptismal classes. Please watch for details. Please contact Pastor Worrad or the church office, if you are interested in being baptized. Victory Garden Planning & Visioning - meet for Lunch, April 14 in the West Room. Since 2013, PMC has had 20 raised vegetable beds on the north side of the parking lot. (The produce goes to the Salvation Army Shelter kitchen) This is a great way to meet new people & reach out to people for Christ's sake. See Geoff Beatty: geoffsidy@gmail.com 289-775-1648. Open Homes Hamilton - Want to learn more about welcoming refugee claimants? Join the Open Homes Hamilton team on Friday, April 12 at 7 pm at The Vine to learn more about home-based hospitality through the film The Visitor (2008, PG-13). We'll enjoy light refreshments together, watch the film, and end with discussion on the themes of hospitality in the film. McMaster Gospel Choir Concert @ Philpott on Saturday, April 6th, 7:00pm, doors opening at 6:30pm. McMaster Choir is a completely student led group with a strong passion to serve God and our greater community. This night will be filled with prizes, dancing, joy and most importantly, praise and worship, with proceeds going to Empowerment Squared. You can purchase tickets either on the McMaster Campus (student centre), or through direct email contact at macgospel@hotmail.com or at the concert doors. Find them on their Facebook page entitled "McMaster Gospel Choir" for updates. Join us for our ASH WEDNESDAY PRAYER EVENT, March 6, from 12:00 noon - 8:00 p.m. Bring your families and invite friends to visit our prayer stations throughout the day. We will be focusing on Jesus in the Wilderness with scripture, prayer, music, art, and resources to take you through Lent. Ash Wednesday marks the beginning of Lent, the 40 Days of preparation leading up to Easter. The example of Jesus in the wilderness for 40 days is a common theme during Lent. In biblical times, people covered their heads with ashes or wore sackcloth (like burlap) as a sign of repentance - of being sorry for things they had done wrong. Traditionally, on Ash Wednesday, Christians have marked a cross with ashes on their foreheads. This is practiced in many churches today. it is a sign of wanting to turn away from sin. It is also a sign that life will end, and that our lives are in God's hands. In the 1st 3 centuries of Christian experience, preparation for Easter varied from 1 - 2 days to at most a week. The 1st reference to "Lent as 40 Days of Preparation" was at the First Council of Nicaea in AD 325. By the end of the 4th century, 40 Days of Lent was established in the Roman Catholic church. Now, many Protestant churches also observe Lent, and other dates in the Christian calendar to help Christians intentionally reflect on the life of Jesus and to respond in needed ways to His love and sacrifice. For more information, contact Jesse Hill (worship arts pastor), Jan Mutter (family life pastor), or Val Harvey (contemplative prayer). Christian Camp Day is Sunday, February 17th. Come to the Atrium before and after the service and learn about some of the many Christian camps in Ontario. Christian Camping: a key tool in discipleship. Join us for our communal Soup & Bun Lunch, following the worship service, Sunday, February 3, 2019. Please consider becoming part of a help team in order to keep these events viable. Contact James Dean for more details, jamedean026@gmail.com or 905-515-0933. There will be a Plan to Protect Orientation/Refresher Training for Youth on Sunday, January 20, at 10:45 a.m. in the Upper Room. There will be a Plan to Protect Refresher Training on Monday, January 21, 7:00-8:15 p.m. in the West Room. One-2-One English Conversation Partners (bringing Newcomers & the Philpott Community together). You don’t have to be a teacher to get involved in this great opportunity to learn about the cultures of Newcomers: International students, Refugees and Immigrants who are making Hamilton their new home. 2) Submit your name as a conversation partner who is ready to meet regularly during the week with one of our Newcomer friends. Our First session for 2019 begins on Monday, Jan 14th. check us out - no obligations. or Sunday, January 13, after the morning service. Congregational Prayer Meeting Wednesday, December 9th @7:00 pm in the Atrium. Join us for an evening of prayer as we begin this new season at Philpott. Pray for our staff, our church family and our community as we seek God's direction and leading in the coming months. MOPs and MOPs NEXT - Wednesday, January 9th, 9:30 to 11:15 am. Childcare provided for pre-schoolers. Moms of all stages are welcome! January 23rd - “Raising Boys” and Accessory Exchange. If you are new to Philpott Church and would like to find out more about who we are, then sign up in the Atrium at the coffee counter for the NEWCOMERS’ LUNCH, Sunday, January 6, 2019 following the service. Lunch provided. Join us for a carol sing service, December 23, 10:45 am. Christmas Without Borders, on Sunday, Dec 16 at 6:00 pm, in the PMC Atrium. If you would like to be a guest (you are a newcomer to Canada or would like to mingle with our Newcomer friends) please come to the atrium and sign up with Geoff. We are also looking for helpers: in the kitchen and with cleanup after dinner. Space is limited: You must sign up, in order to get a seat. Join us on Sunday, December 9th at 4:00pm for free Christmas concert performed by the Salvation Army Brass Band. Invite your friends to celebrate Christmas with favourite musical selections. 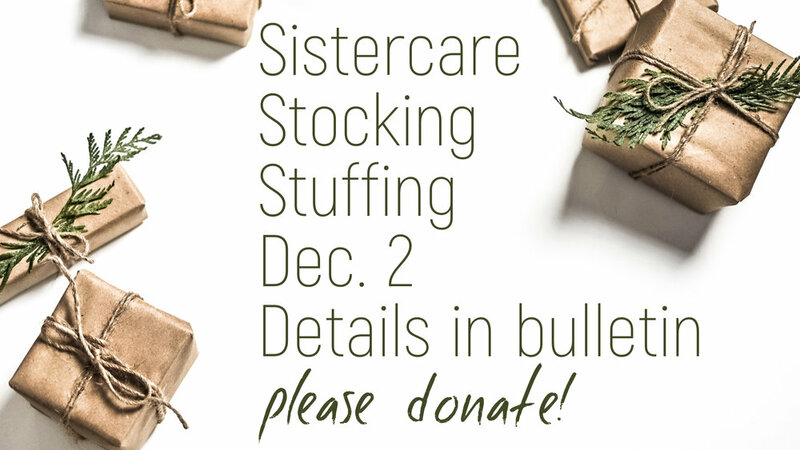 Sister Care Christmas Stockings: please donate generously during November: tooth brushes/tooth paste; combs or brushes; $5 gift cards for McDonald's or Tim Horton's; pens/pencils; note pads; book marks; chocolate bars; Candy Canes; Bubble Bath/Shampoo. Join us to stuff stockings, Sunday, December 2nd after soup lunch. Look for the red baskets! Advent Taize Retreat, Saturday, December 1st, 9:00-11:00 a.m. Join us as we celebrate the coming of Jesus with Taize music, silent prayer, scripture and candlelight, in the Vine building (corner of Park & Vine Sts.). Are you new to Philpott? Discover what Philpott Church is all about. PMC Newcomers’ Class on Sunday, November 18th, @12:30 pm in the West Room. This class will be run by our Worship & Arts Pastor, Jesse Hill. Light lunch is provided. Women's Ministry - Christmas Event on Saturday, November 17. Come, enjoy Christmas treats & music; learn multi-media crafts with a local Hamilton artist. Please RSVP at the Welcome Desk or contact Karen: karenbarker47@live.ca or 289-426-2128. cost $15. Annual General Meeting on Sunday, Nov 11th, following the worship service. Light Lunch will be provided. Please plan on attending. Friday Night Youth activities will also be happening at the same time. Child care is provided. Budget Townhall Meeting – Thursday, November 1, at 7:00 p.m. Please mark your calendar and plan on attending. Come see actor Bruce Kuhn performing the Gospel of Luke at PMC! A very special event hosted by IMAGO arts and the Canadian Bible Society Cost is $10 at the door.